Using the slow cooker to prepare a meal allows you to come home to a hot, delicious meal. When paired with simple side dishes, these chicken drumstick meals will take minimal time while satisfying your entire family. This chicken has a nice mix of sweet, salty, and spicy, giving it a balanced flavor profile. Serve it with steamed rice, which you can purchase fully cooked in the freezer or rice section of the grocery store. Add a side of steamed pea pods for a complete meal. 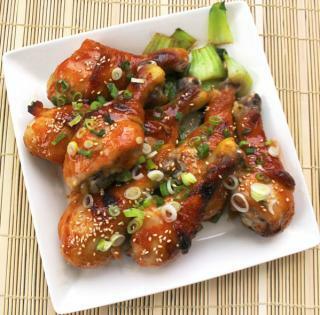 Put the drumsticks in a slow cooker. In a small bowl, whisk together the soy sauce, sriracha, rice vinegar, brown sugar, red pepper flakes, and garlic powder until smooth. Pour the sauce over the chicken and stir to coat all the drumsticks. Turn the slow cooker on to low. Cover and cook for six to seven hours. Remove the lid and set the chicken legs aside on a platter, tented with foil to keep warm. Pour the sauce into a small saucepan. Whisk together the cornstarch and water until smooth and add it to the saucepan. Simmer until the sauce thickens, about four minutes. Serve the chicken on a bed of rice with the sauce poured over the top. Garnish with thinly sliced scallions and sesame seeds. 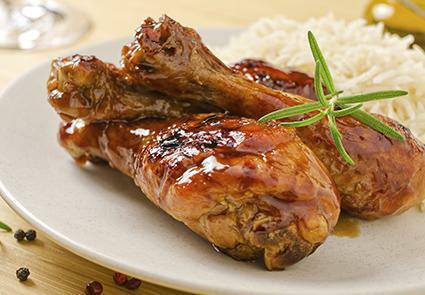 This recipe calls for orange chipotle barbecue sauce, which you can make ahead of time and refrigerate until you're ready to cook the drumsticks. Alternatively, you can use any commercial barbecue sauce in place of homemade. Serve alongside a crisp green salad and some classic baked beans. Put the drumsticks in a slow cooker and put the sliced onions over the top. In a small bowl, whisk together the barbecue sauce, garlic, orange zest, and cayenne. Pour the sauce over the chicken legs and stir to coat the chicken and onions with the sauce. Remove the lid from the slow cooker and turn it to high. In a small bowl, whisk together the orange juice and cornstarch. Stir the mixture into the slow cooker. Simmer, uncovered, on high for one hour more, until the sauce thickens. 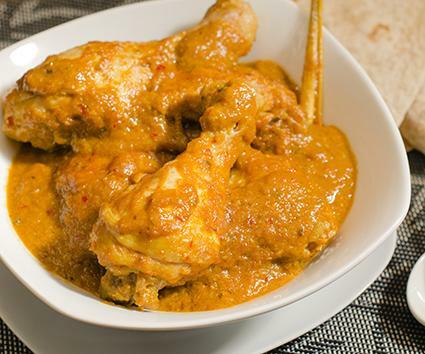 Use your favorite curry blend for this recipe. Serve with white rice and slices of cantaloupe. Put drumsticks, onions, and sweet potatoes in the bowl of a slow cooker. In a small bowl, whisk together the garlic, curry powder, and coconut milk. Pour over the mixture in the slow cooker and stir to coat the chicken and vegetables. Turn the slow cooker on low and cover. Cook for six to seven hours. Serve garnished with cilantro. Serve the lime wedges on the side. If your slow cooker is large enough, you can easily double all of the recipes above so you have leftovers for tomorrow's lunch or dinner. 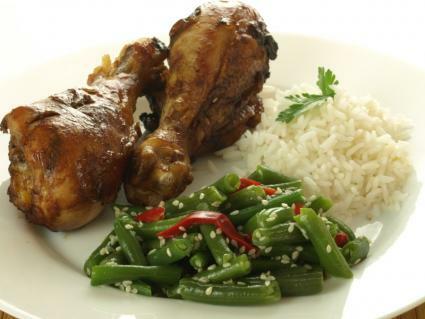 Using a slow cooker to make chicken legs allows you to create hot meals that are ready to eat after a long day at work.